It’s safe to say people are more passionate than ever about the beautiful game with more than 30 million Brits tuning in to watch England’s semi-final game at the 2018 World Cup. Clubs are faced with the challenge of remaining connected with their increasingly smartphone focused supporters. Clubs need to consider their options now, given the new football season is mere days away. Maybe you need to sell your remaining season/matchday tickets or increase attendance numbers? 85% of UK adults now own a smartphone. Many keep their phones to hand for more than 16 hours per day. Engaging with your loyal fans through mobile and multi-channel communications is the ideal solution to selling those last minute tickets. Football clubs are able to share pre-match line-ups, real-time results and vital player news directly with supporters. Better yet, this can all be done with the power of a simple SMS marketing message. SMS communications are the cost-effective way to communicate with your intended audience. With a 98% open rate, no other channel comes close to guaranteeing that your message is read. One of our existing clients from the Premier League uses Textlocal to keep their fans up to date with limited ticket releases. With just one £75 SMS campaign they were able to generate £6,500 in ticket sales, streamlining this particular digital journey. Our research shows that over 37% of people have made a purchase as a direct result of receiving an SMS. 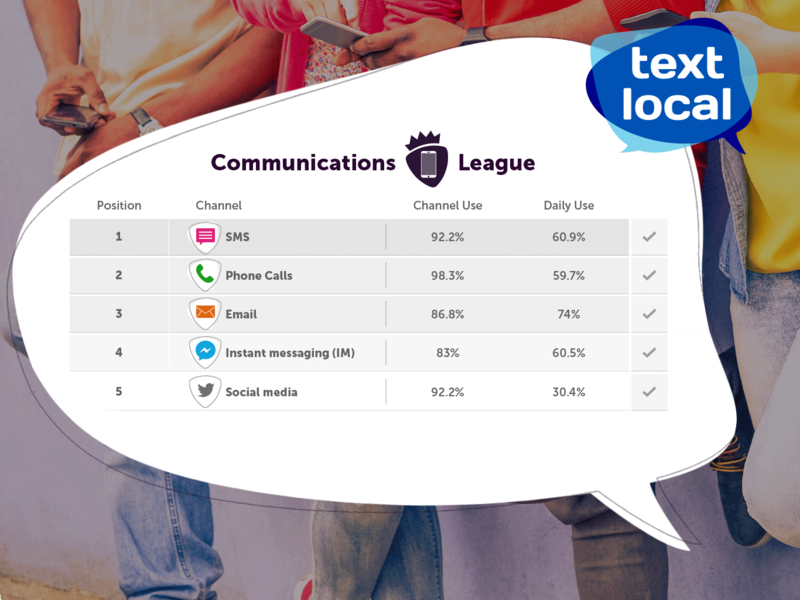 Given this research, SMS proves to be the channel that can have a significant impact on business revenue streams. On average in the UK, smartphone users spent £433.41 on their mobile devices in 2017. This highlights how m-commerce is continuing to change the way consumers are engaging with their favourite brands and teams. Opportunities are there for the taking if clubs are willing to adopt mobile communication initiatives to improve and encourage additional sales. Text messages are the way forward when it comes to engaging with fans and keeping them well informed. Not everyone wants to queue up at the ticket office, so why not send your fans theirs before the match? You can easily do so with our mobile ticketing feature. Further research, the Mobile Consumer Behaviour Report explored the various channels consumers use and engage with on a daily basis. Out of all of them SMS is top for the daily usage at 60.9%. Why wouldn’t you use this channel that is most used by your customers, for fan communications and alerts? Request a call back today if you’d like to discover more about mobile messaging. Our team are happy to help talk through the opportunities of integrating additional channels into your marketing.